This reading is in contrast to the reading for archetype 41. This reading describes God making an offering to people. In the previous reading, people were making offerings to God. This reading is best understood metaphorically. Obviously God does not have a physical son, and God is not any kind of physical father. God is love (1 John 4:8). This reading describes the essence of God reaching out to us in the most intimate possible way, by incarnation into a human who will model for us the way to live in relationship with the love that is the ground of our being. 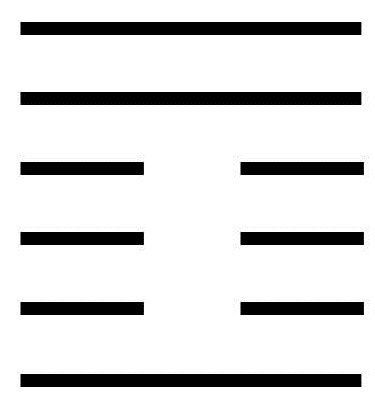 This hexagram consists of the trigrams Spirit on top and Word on the bottom. These two trigrams have bottom lines that seem out of place. The upper trigram is missing a strong solid line to complete its set. It seems that that line has dropped down into the lower trigram, which has exchanged it for a weak line. To know that to rule well is to serve. For the powerful to make joyful sacrifices for the weak. To understand that when the powerful sacrifice for the needy, the needy are given hope and respond with gratitude. To realize that grateful people will support even the most difficult and dangerous undertakings. To make good use of an auspicious time by cultivating creativity and giving birth to new forms. To notice the good in others and emulate it. To notice the bad in oneself and correct it. A moving line in the bottom position is advice on how to use help that comes from someone with power. This help is to be used to achieve something great that would have been impossible without the offered help. Thus the energy offered is not to be hoarded, but shared generously. A moving line in the second position suggests how to attract energy. One attracts energy not by trying to capture the energy, but by creating receptivity to that energy. Like attracts like, and positive energy will be attracted to one with a positive attitude and positive intention. With such energy, one can produce works blessed by God. A moving line in the third position predicts that a time of blessing has come, and that even seemingly negative events will turn out to be positive. Tough times can lead to our spiritual purification and the burning away of Ego. With Ego out of the way, we are free to act in harmony with Wisdom. A moving line in the fourth position points to the need of an intermediary between those who lead and those who follow. These intermediaries must not allow their own Egos to impede the flow from the leaders to the people. It is their job to see to it that what is given arrives where it is most needed and to be a positive influence on the leaders. The importance of this for great undertakings cannot be over-emphasized; this will prove decisive. A moving line in the fifth position suggests the need for kindness. True kindness does not look for gratitude; it acts through Wisdom and is satisfied with seeing the positive results achieved. A moving line in the top position warns that those in power must not neglect to give to those who are not in power. Failing to give leaves them alone and vulnerable to attack. One must rest before moving, think before speaking, and build relationships before requesting. People do not cooperate with one who is brusque. They don’t resonate with one who is angry. They don’t give to one who has not developed relationships.